caltex – the exclusive sponsor of “don’t drink and drive this season” campaign | Welcome to Chevron Lubricant Lanka PLC. “Don’t drink and Drive this season” campaign was launched on the 17th of November 2017, near the Torrington square, Colombo 7. The campaign launch event was attended by the Inspector General of Police, Mr. Pujith Jayasundara, senior officials of the Sri Lanka Police department, Road development authority, Caltex and the media. According to the government statistics 8 people per day has died in the year 2016 due to road accidents in Sri Lanka. Many have faced a life time in disability and many more have lost their loved ones, especially the bread winner of the family causing serious socio- economic burdens for the family as well as the country. This unfortunate situation can be and should be managed immediately through effective awareness on road safety. Caltex has been the corporate leader promoting road safety in Sri Lanka for over a decade. 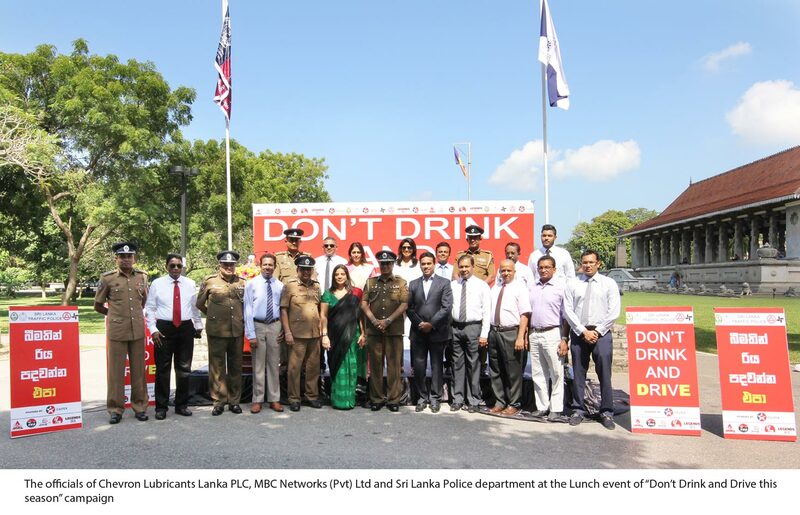 This year to kick off the company’s CSR initiatives on promoting road safety, Caltex exclusively sponsored the Don’t drink and Drive this season” campaign organized by the Sri Lanka Police Department in collaboration with the MBC networks (Pvt) Ltd. Since the year 2003 Caltex has made significant contributions to promote road safety in Sri Lanka. “Caltex Drive Wise, Embrace Life” Road Safety awareness campaign was launched in the year 2012 by Chevron Lubricants Lanka PLC together with the Sri Lanka Traffic Police department. In the year 2017 for the 13th year under the “Caltex Drive Wise, Embrace Life” title, “Caltex drive wise, Embrace life -2017” program will be implemented in collaboration with the Ministry of Law and order and Sri Lanka Police department to further strengthen the efforts to promote road safety. “Caltex drive wise, Embrace life -2017” is also supported by the Road Development of Sri Lanka. As per the plan this year Caltex will sponsor road safety cut outs with strong and emotional road safety messages and A- boards with road signage’s to be displayed and used by the Sri Lanka Police department at public places such as near schools, Police stations and markets. Further the company is planning on sponsoring “Train the Trainer” programs for the instructors of driving schools to address the identified need to provide updated and effective road safety awareness for the future generation.